Street Fighter is known in the gaming community for possessing two qualities: deep, balanced gameplay and incredibly competitive, online player-vs-player matches. It's also known for having umpteen ports that land on just about every gaming platform known to humankind. So here we are again with another port of a Street Fighter game, and one that fans are probably already familiar with. 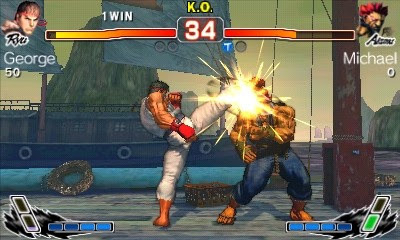 While you may be wondering how playable Super Street Fighter IV 3D Edition is considering the button layout and small screen found on the Nintendo 3DS, you can rest assured that Capcom has somehow managed to pack the console experience into a tiny 3DS cartridge. Let's be clear that for those arcade purists out there, SSFIV 3D Edition isn't a replacement for its console cousin simply because there's no way you're playing this game with a 6-button layout arcade stick without some crazy Macgyver﻿ modding to your Nintendo 3DS. With that said, the game plays surprisingly well using the Circle Pad and face buttons on the 3DS, and thanks to innovative touch screen controls this is easily the most accessible Street Fighter game to date. 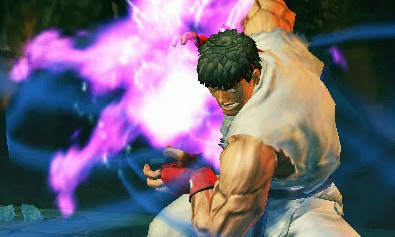 Considering that combat in SSFIV 3D Edition requires six attack buttons (3 punches/3 kicks), Capcom recognized that using the shoulder buttons simply isn't feasible, especially for Ultra Combos which requires players to press all three punch or kick attack buttons at the same time, and so they've introduced touch screen controls using the lower Nintendo 3DS touch pad. 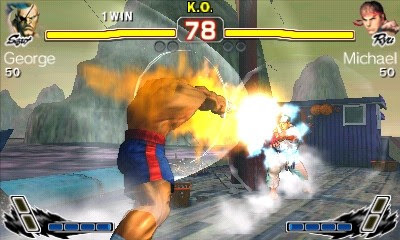 There are two types of touch controls available, Lite Controls which lets players assign the four touch buttons to perform advanced moves such as Special Moves, Super Combos and Ultra Combos, and Pro Controls which limit the one-touch shortcuts to basic moves such as all three punch or kick buttons, throws, and Focus Attacks. I'm sure some Street Fighter fans will cringe at the idea of one-touch combos and special attacks, but I found it added so much accessibility that my overall enjoyment of the game with improved. As someone who tends to stick to the familiar characters from Street Fighter II such as Ryu, Guile and Chun-Li, I found with the touch screen controls that I was much more open to experimenting with the new characters like Juri, C. Viper and Rufus. Sure, it might make some players too lazy to learn how to perform special moves using input commands, but those people (me included) probably have no interest in playing Street Fighter professionally anyway. It's impressive just how much content and detail Capcom managed to pack into SSFIV 3D Edition. All your favourite modes from the home version are here including Arcade, Versus, Internet Match, Training and Challenge, which lets players practice the Car Crusher and Barrel Buster bonus stages as well as compete in a series of increasingly-challenging trials. 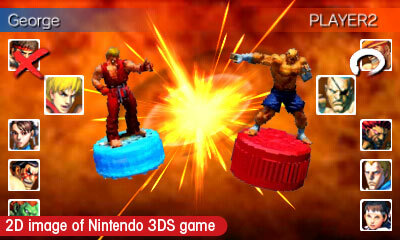 Since this game is on the Nintendo 3DS, Capcom thought to include an interesting 3D Versus mode that presents battles from an over-the-shoulder ﻿perspective that takes full advantage of the portable device's stereoscopic 3D capabilities. It is cool to see, and it's something you'll want to show to your friends, but ultimately it's not very useful for precise gameplay and you'll switch back to the 2D mode in no time. There is online matchmaking included, as well as local Wifi for Versus mode. When an online match concludes you'll earn or lose Player Points and Battle Points depending on how well you did. Player Points is essentially a measurement of your overall skill based on total wins/loses, and Battle Points measures your skills with specific characters. There are three match types available using Internet Mode, which are Quick Match for jump-in play without setting conditions, Custom Match for defining match conditions prior to battle, and Friend Match which limits opponents to people on your friends list. SSFIV 3D Edition also includes a brand new mode called Figure Collection that lets players trade in Figure Points earned during the other modes for character figurines. Using a Nintendo 3DS wireless connection, players can view and trade figurines with their friends to help build their collection. There's also a battle system that uses the Nintendo 3DS StreetPass mode, where players can choose five of their figurines to do battle with people they encounter who also have a figurine team selected and StreetPass enabled. Fights occur automatic and based on how your figurines perform, additional Figure Points can be earned. Porting the game over to the Nintendo 3DS did come with one sacrifice, many of the background objects and animations are completely missing. What we're left with are bare bone environments with only a handful of objects in each, and for the most part everything is static. It's a shame this cut had to be be made, but in all fairness this is the background we're talking about, not the core gameplay. Easily the best Nintendo 3DS launch title, SSFIV 3D Edition is also the best fighting game ever to grace a handheld platform. It's amazing that Capcom managed to stuff the entire console experience into a Nintendo 3DS cartridge with only minimal sacrifices, and arguably many improvements. This is a game that Street Fighter fans will still be playing in years to come.